The telecoms world is a multiple offender when it comes to acronyms: SIP, RTP, PBX, ACD – the list goes on. One which is very commonly used is IVR (Interactive Voice Response). This piece will answer the question: what is IVR technology? as well as show its key applications and benefits for the cloud based call and contact center. After a technological breakthrough by Bell System in the 1960s, it was possible for dual-tone multi-frequency (DTMF) inputs to be transmitted and interpreted via telephony. However, IVR software only began to grow in commercial use in the 1980s after hardware advances made the technology more affordable. It was available to large enterprises only, and the term was used strictly to denote the system by which a voice or DTMF input was processed. It was not until quite recently that the acronym began to define a significant component of the call flow itself – menu structures. Now that computer-telephony integration (CTI) is widespread and the voice-recognition technology market has yet to properly take off, the term is mainly used by modern telecoms service providers to describe menu structures navigated via DTMF. There are various uses of IVR technology for contact centers, though they can be united under the theme of automation. It is very convenient in many cases for a caller to be able to make a series of inputs to convey information. Often an IVR input will be among the first things a caller hears, so that they can choose the service which will best solve their query. An IVR input can also be used beyond service selection. It is common for agents or audio prompts to ask a caller to enter a number via DTMF constituting an important piece of information: an account or reference number, another phone number or card payment details, for example. Improved customer experience (CX) – breaking down multiple and different service types in a clear and efficient way obviates or reduces the time a caller spends on hold, speaking to the wrong agent or navigating to services. These are key customer pain points resulting from poorly-designed menu structures, and will almost always result in bad experiences. CTI/multi-channel integration – IVR structures allow a business to provide callers with the opportunity to switch channels and find the best one. For example this could be from the call to a web interface, or an IVR input triggering an automated SMS. 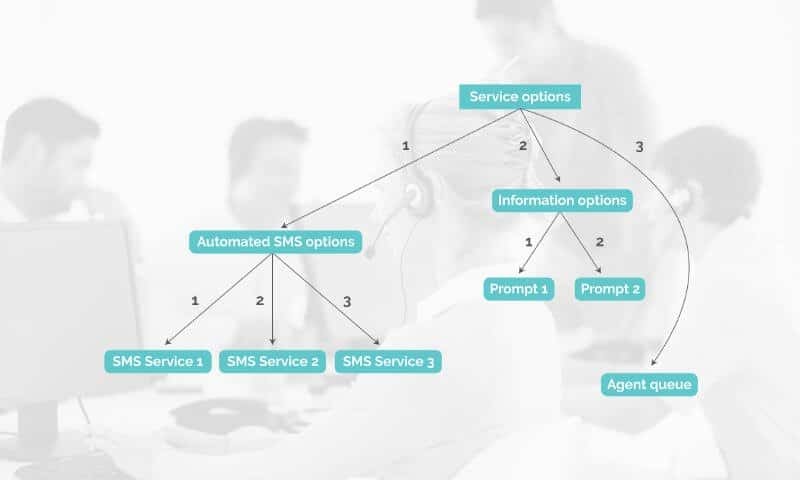 Decisions and inputs made in IVR application can also interact via an API with other customer contact applications like CRM, Helpdesk or BI, where the multiple channels can be brought together and monitored. Automation – the increasing importance of providing automated or self-service options for optimizing CX lends itself to IVR technology. Offering a structure of options delivered by audio prompts enables 24/7 services to be constructed. A caller does not have to wait on hold and the solution of their query is not necessarily dependent on agent availability. Another core benefit of IVR-controlled automation is that spikes in call volume can be dealt with effectively, reducing bottlenecking and call center costs. So what is IVR technology? As well as offering a range of applications in the contact center, IVR is a crucial tool in optimizing CX through efficient service design. The advent of CTI and more sophisticated cloud platforms has transformed IVR into the part of telephony infrastructure which helps join up channels and services. © 2018 babelforce GmbH. All rights reserved, worldwide.